Pennsylvania is home to many Amish markets, from PA Dutch markets with Amish vendors in cities such as Philadelphia or Allentown, to farm markets located in Lancaster County and elsewhere. Lancaster County itself is home to many of the Amish vendors who travel to off-site markets in Pennsylvania and other states. In multi-vendor suburban/urban markets, Amish stands typically are open three days per week (Thurs-Fri-Sat), though schedules may vary, with some being open additional days (if uncertain, check with the market itself via contact info given below). You’ll find info for two dozen PA Amish markets below. Know of a good PA Amish market we missed? Let us know in the comments. Sizeable market containing a broad choice of products provided by Amish and non-Amish vendors. Bakery, deli, seafood, produce stand, and hot food options. Also contains a large furniture outlet, crafts store, and outdoor furniture and structures. Foods including organic produce, baked goods, gourmet coffee, barbecue, salads, meats stand, and pretzels. Amish grown fruits and vegetables. Extensive selection of products including some Amish-made such as dumplings from family-owned Arianna’s Bakery and Amish canned vegetables. Amish-owned road stand selling canned and home-baked goods. Sixteen vendors under one roof, both Amish and non-Amish, selling a broad choice of fresh products. Amish and non-Amish vendors, providing a wide array of foods, bulk foods, cheeses, groceries, fresh produce and much more. Takes place every Saturday in front of the New Garden Township Maintenance Garage. Fresh produce locally grown by Amish and non-Amish suppliers. Amish baked goods available. Fresh produce from Amish farms. Bristol Amish Market provides fresh seasonal produce, bulk foods, meats, cheeses and much more. Crafts and furniture available as well. A bustling urban market offering a wide selection of stands selling foods and products from around a world, in a historic location operating since 1892. Amish homemade goods available, and ten Amish/Mennonite vendors in the “Pennsylvania Dutch” section. Located in Center City Philadelphia. 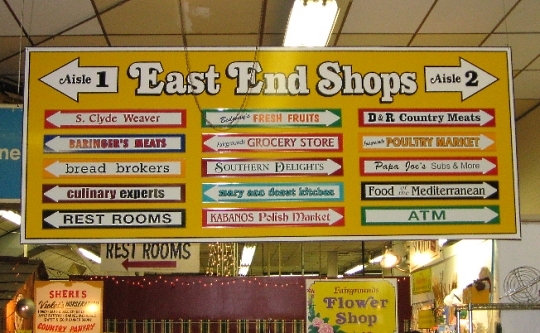 Shop listings inside the Allentown Farmer’s Market. Home to over 60 stands run both by Amish and non-Amish sellers, offering an array of products including Amish homemade baked goods. A 30-acre outdoor market with Amish meats and baked goods, fresh fruits, vegetables, antiques, collectibles and much more. Amish owned and operated farm. Provides fresh produce and homemade baked goods such as whoopie pies, pumpkin rolls, breads and more. Home preserved goods, root beer, horseradish available as well. Amish farm market, locally owned and operated by Elam & Naomi Fisher, features homemade root beer, baked goods, home canned preserves, and handcrafted gifts. Carries broad selection of Amish products including fruit butter, meats, cheeses, Amish Wedding foods, granola and noodles. Family owned and operated farm and market. Offers fresh produce and specialty items for over 150 years. Amish homemade fresh baked goods available. Offers a range of products provided both by Amish and non Amish vendors. Amish owned and operated variety store. Features groceries, bulk foods, cheeses, meats, kitchen gadgets, housewares, books, vitamins, herbs, dairy products and much more. Hormone-free milk and homemade ice-cream made on an Amish farm. Farmer’s market and auction grounds on 30-acre site in Lancaster County. Indoor and outdoor vendor spaces. Numerous fresh food sellers. Open Friday only, from 9am to 9pm (8pm in Jan & Feb). Would be nice for these types of businesses were also listed, not just the tourist trap markets. Bill I agree the smaller Amish stores need to be listed as well, though probably in a different section. Right now we have a mix of markets/stores above, though a lot of them are of the PA Dutch market model with a number of Amish vendors under one roof–though a few might fit the description, I’m not sure “tourist traps” is an accurate description of a lot of these places. Ideally this would be just the PA Dutch farmer’s market listings with those smaller free standing stores going somewhere else. If you or anyone else would like to compile such as list of smaller Amish food category stores I’d be glad to use it to build a new page. I have that on the list of things to do but have not gotten to yet. Anyway I appreciate the comment; the reason I deleted the other comment you left is because it was identical info as this, and since these are PA businesses, would rather have it posted here than in the general market section. I would love the list of smaller Amish food category stores since we are very soon going to be making a trip to the Lancaster area and plan on trying to find some of the smaller Amish run roadside markets and stores. I am especially interested in a genuine Amish run bakery. One of the bulk food suppliers has on online store locator. It’s a great help and source of information to find bulk food stores in any part of the United States, and match them up with zip codes from Amish settlements. For example, Kinzers, PA is 17535. Not all bulk food stores are Amish or Mennonite, but many are. Did you ever compile a list of the smaller stores? I am heading out to PA soon and I’d like to buy direct.I think my daughters would like the experience. I am looking for food and those round bowls they use as well as an Amish second hand store, if that exists. I’m sorry, haven’t been able to do that. If there is a specific area you are going, maybe we can direct you to some places. has an interactive map for Shopping Local Shops, Bakeries, Artisans, and Farmers Markets. It might be a start, although some listings may not be what you have in mind. You can also Browse by Category for Bakers, Builders, Cabins and Sheds, Fabric Stores, Produce, Quilting, and more. Another source of information is the Lancaster County Business Directory Online, where you can search for Groceries, Housewares, Storage Sheds, etc. The 2015 Lancaster County Business Directory with 452 pages has an index in the back for Groceries, Health Foods, Housewares, Hardware, and more. is also known as the Amish Walmart! Leilah, you asked about an Amish second hand store. Unique to this location, Country Gift and Thrift plays host to regular “quilting bees,” where local Amish and Mennonite ladies regularly convene in the quilting room to quilt beautiful new quilts that are available for sale. Second Street Thrift, in Denver, PA, benefits Home International. If you ever come to Holmes I’d be glad to give you a list of “Amish” stores in the area. I agree that the small markets should be listed. I live in Western PA. I never go to a market that says Amish in their name. They double and triple the price. Amish furniture is not cheap; however, it is worth it though in most cases, so it is better to go directly to the source. The produce and eggs are fresh and a fraction of the price. The baked goods are reasonably priced but usually amazing. I go to the Amish farms and their houses In New Wilmington and Atlantic PA. I find new ones all the time by following signs along the road. I will be doing a sales trip out in the PA area, specifically targeting the Lancaster County area. I know some grocery stores sell supplements/herbs, but do you have a list or can you direct me to a list of businesses currently selling supplements? I’d love to make more specific travel arrangements to visit these locations. Thank you! I am interested in opening an indoor Amish marketplace in NE Pennsylvania. Any suggestions as to vendor contacts? Thank-you. Can you tell me the location of the Amish/Mennonite Farmers Market? I’ve seen the YouTube video of it but it doesn’t give the location. Thanks! Wm., are you talking about Root’s Country Market? Or do you mean a produce auction, or something else? It would be interesting to know which YouTube you are referring to. Wm, I found a YouTube for “AMISH / MENNONITES FARMERS MARKET IN PENNSYLVANIA LANCASTER COUNTY, THE OLDEST.” The comments guess it to be either Green Dragon, Root’s Market, or “Lewisburg Farmer’s Market, Lewisburg, PA, Union County.Held every Wednesday.” The maker of the video said “THEY HOLD A FARMERS MARKET TWICE WEEKLY.” This mystery should be solved! I’m in Johnstown,PA, I’m looking for a Meat Market, where I can purchase fresh meats, steaks, chop meat, ect. Does anyone know of any? I don’t mind driving. Good evening, last fall my wife visited an Amish market on route 15, she would like to visit it again when we drive up from Virginia but cannot remember where it is. Raymond, I don’t have an answer, just some clues about an Amish market on Route 15. Do you know in which county of Pennsylvania it was? Sometimes a road will have a second name as it goes through a town. I am doing research on autism and I know the Amish have a very low rate compared to the general population. I’m wondering if some children are exposed to conditions outside of the home. Do parents of infants take them with them when they work at farmers markets or other such places? Thank you for your time and consideration. I hope to hear from you soon. the Amish do not vaccinate. they also eat food that is grown with true sustainable farming methods. we ARE what we consume. That would be hard to determine. We used to do the farmer’s market. Sometimes a child or two would go with us, sometimes not. Friends of ours took their children along regularly while another family didn’t feel it was appropriate. There is going to be a big variety in that. Some of the variables might include where the market is, the time of year, the age of the child, the availability of babysitters or do one or both parents go, and so on.